September 18, 2014, 2:48 p.m.
Three years ago the protesters at Zuccotti Park were settling down for their second night camping in the heart of New York City&apos;s financial district. Over the next few months the camp, and its offshoots around the country, would come to dominate the national headlines. Three years on, however, the movement&apos;s stated goals of a more equal America seem as far away as ever. And, unlike the Tea Party, which also emerged in the wake of the financial crisis, Occupy Wall Street has not had much impact on major parties and their policies. 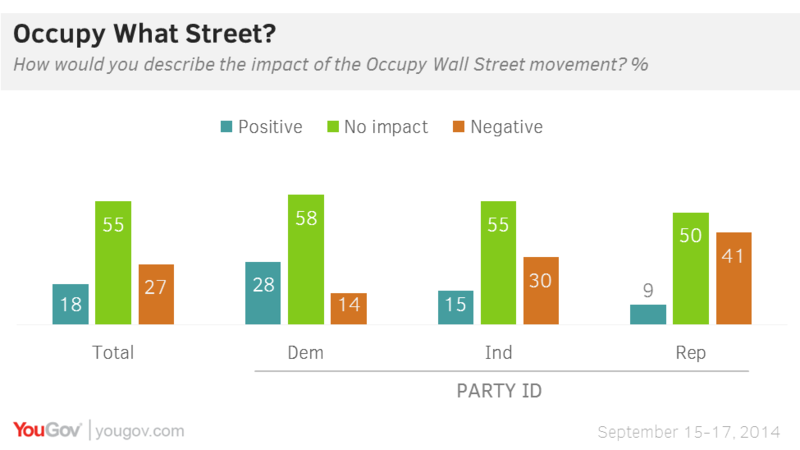 The latest research from YouGov shows that most Americans (55%) say that the Occupy Wall Street movement has had no impact on the country. Overall, only 18% say that it had a positive impact, while 27% say that its impact was negative. Democrats are the most likely to say its impact was positive (28%) and to say that it had no impact (58%). Most independents say that it had no impact (55%), but 30% think that it had a negative impact. Fully 41% of Republicans, however, think that the movement&apos;s impact was negative while 50% think it had no impact. Despite the widespread perception that Occupy Wall Street (one of the largest American protest movements in recent years) had no impact, 49% of Americans say that protests are an effective way to change society. 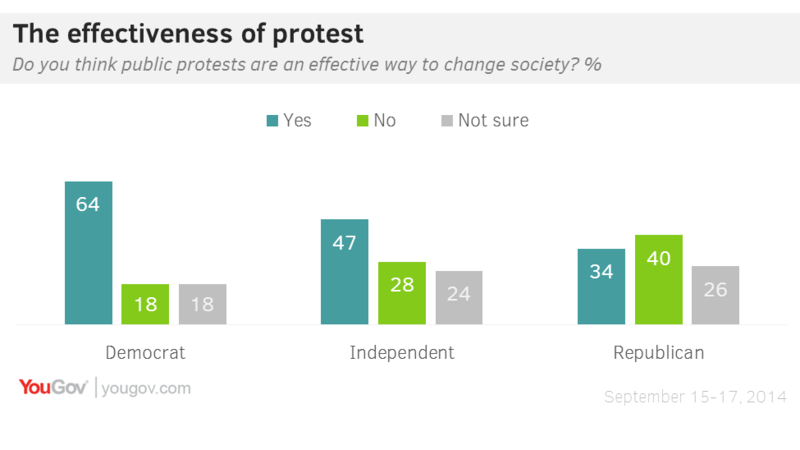 23% aren&apos;t sure, while 29% say that protests aren&apos;t effective in changing society. On the whole, Democrats tend to have more faith in the power of protest. 64% of Democrats say that protest are effective at changing society, while 18% say they are not. 40% of Republicans, however, think that protest is ineffective while only 34% say that it is effective.